These are the Days of the Expanding Fire. 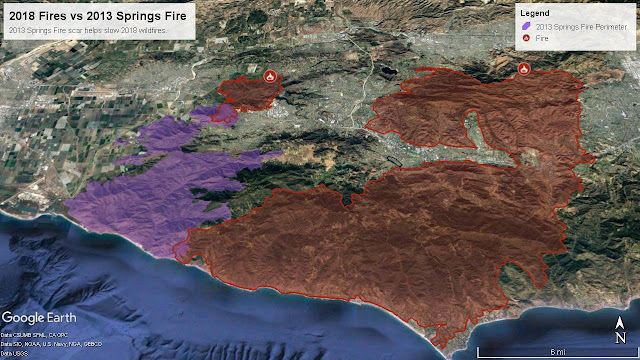 Currently the entire western Santa Monica Mountains are either burned, or going to be burned. Years of persistent drought, global warming weather have brought us here. Fires that used to be confined somewhat to autumn are now year-round. A big hole has been blown into the SoCal ultra calendar. The Ray Miller 50/50/30 is cancelled.I'm expecting the Sean O'Brien 50/50/100k [Feb 2 2019] to follow suit. Race management has promised rollovers to next year. Backbone Trail 68 & 100, gone.Also cancelled this weekend was the No Name races that were slated to start/finish in Chesebro Cyn up in Agoura. Just yesterday [Nov 12 2018] Rocky Peak and Corriganville burned, up in Simi Valley. Malibu was under mandatory evacuation. Any property up a winding canyon road is likely a goner. The Pacific Coast Hwy [PCH] was all four lanes southbound last week, to allow people to flee. CalFire is stretched to the limit. Year round.